To no one’s surprise, the virus blamed in the deaths of more than 750 bottlenose dolphins as far south as the Carolinas has reached even farther south to Florida. A bottlenose dolphin that stranded near Jacksonville recently tested positive for dolphin morbilllivirus, a measles-like pathogen that affects the animal’s lungs, brain and immune system. Morbillivirus is the suspected culprit that spurred NOAA Fisheries to declare an Unusual Mortality Event in the mid-Atlantic this summer. In September, three stranded dolphins in South Carolina that were likely infected led to Georgia being declared a morbillivirus “suspect” state (“Noteworthy,” Oct. 11). Last week, Nongame Conservation Section biologist Clay Georgia, head of DNR’s Marine Mammal Stranding Network, said “suspect” no longer applies. Case in point: A pygmy sperm whale that washed up on Jekyll Island Oct. 15 (“Noteworthy,” Oct. 31) tested positive for what initial analysis indicates is the same strain of morbillivirus infecting dolphins. Further tests of tissue sent to UGA may show whether the pathogen affected the health of the whale, which also suffered a stomach impaction apparently caused by ingesting plastic. Researchers investigating the dolphin die-off have documented morbillivirus in at least one other pygmy sperm whale as well as humpback whales that stranded in the mid-Atlantic and Northeast this year, according to NOAA’s Dr. Teri Rowles. The morbillivirus outbreak has pushed dolphin strandings – those washing up dead or alive on the beach – from a normal year’s average of 74 to 753 along the mid-Atlantic coast since July 1. George said the last dolphin stranding documented in Georgia was Oct. 3, and DNR hasn’t seen strandings surge so far. He expects that will change as more migratory dolphins move south. If strandings increase, biologists will conduct necropsies and collect samples for testing. But George is most interested to see if the disease spreads to Georgia’s resident dolphin population. 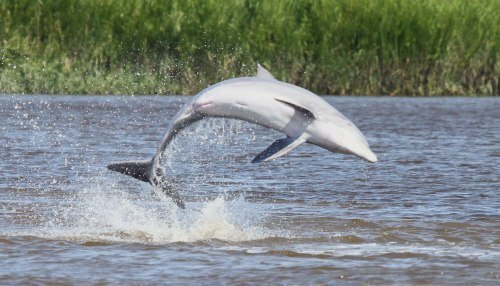 In recent years, DNR and other researchers have developed photo-ID databases of resident dolphins at many sites along the Georgia coast. Impacts on resident dolphins were unknown when the previous morbillivirus outbreak occurred in 1987-1988, stranding more than 700 dolphins from New Jersey to Florida. Report strandings of live or dead dolphins and other marine mammals on the Georgia coast by calling 1-800-2-SAVE-ME (1-800-272-8363). Georgia Marine Mammal Stranding Network. It’s not too soon to begin making preparations for the holidays. Now, I’m not talking about decorating your yard for Christmas. That can wait until next month. What I am saying is it’s not too early to begin collecting items for a holiday bird wreath. In recent years, bird wreaths have appeared in a growing number of yards across Georgia. These wreaths are attractive, fun to make (especially with the help of children) and offer backyard birds a variety of food items. They can be used any time during the year, and November is a perfect time to begin looking for the natural accessories to make them beautiful. Read how-to in Terry’s complete column, including foods to include, from acorns to dogwood berries. And if you make a wreath, please share a photo with him. Terry W. Johnson is a former Nongame program manager with the Wildlife Resources Division and executive director of TERN, the Nongame Conservation Section’s friends group. Previous “Out my backdoor” columns. While considering making a bird wreath, also consider keeping your hummingbird feeders full through winter. Some hummers winter in Georgia, and they benefit from the nourishment feeders offer. 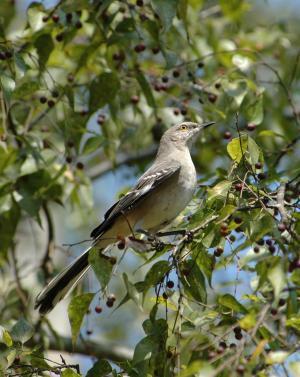 Learn about Georgia’s “second hummingbird season” in this Terry Johnson column from 2010. Boaters, be on the lookout: Sea turtle nesting season is over but sea turtles remain in coastal Georgia waters year-round. The most recent report of strandings listed three turtles, including two juvenile loggerheads hit by boats. Through Nov. 2, DNR has documented 178 strandings this year, slightly fewer than through the same period in 2012 and 2011. Updates. Report strandings: 1-800-2-SAVE-ME (1-800-272-8363). Cha-ching may not be a sound you identify with national wildlife refuges, but a new report says America’s 561 refuges ring up a $2.4 billion economic impact and support more than 35,000 jobs annually. "Banking on Nature" also found that refuges in the Southeast, including Okefenokee, drew more visitors and generated more jobs combined than in any other U.S. region. Don’t miss Georgia’s wildest fundraiser! Registration opened Nov. 1 for the 2014 Weekend of Wildlife, which is set for Jan. 31-Feb. 1 at Sea Island and is a significant source of support for Georgia’s Wildlife Conservation Fund and the Nongame Conservation Section. The latest Georgia Junior Ranger, the DNR State Parks and Historic Sites e-newsletter for kids, quizzes readers about wild berries and seeds, profiles a blue mushroom (the indigo milky), and explores geocaching. Sign-up (like Georgia Wild, it’s free) or check out previous issues. A $21,000 reward is offered for information resulting in an arrest and conviction in the killing of two red wolves in North Carolina. Conservation groups added to the reward after the wolves, one of the world’s most endangered wild canids, were found dead at different sites in North Carolina’s Washington County. How many deer should Georgia have? Explore key management issues regarding white-tailed deer and offer your opinions at one of the open house-styled public meetings the DNR Wildlife Resources Division is holding this month. Flathead worms and misinformation about turtles cleaning out fish ponds are fodder for Consumer Q’s, a regular Georgia Department of Agriculture e-column by Arty Schronce. Learn more, including about Bipalium kewense, at www.agr.georgia.gov. Nov. 12-20: Georgia DNR Wildlife Resources Division public meetings on deer management. Meeting sites, dates, plus management issues and options for submitting comments. Nov. 21: Georgia Native Plant Initiative Meeting and Symposium, 8:30 a.m.-3 p.m., State Botanical Garden of Georgia, Athens. Register. Got a Georgia Wild story idea or comment? Email rick.lavender@dnr.state.ga.us. Next time you’re in the creek out back, flip a couple of rocks and you might find the creature pictured – a white tubercled crayfish (Procambarus spiculifer). This crayfish is common throughout Georgia. It gets its name from the white bumps found on its claws (also known as chela and pronounced kee-lah). Crayfishes are essentially vacuum cleaners on the stream floor: They are omnivores and eat almost anything they come across, including decaying aquatic vegetation, dead animals, aquatic insects and, sometimes, small fish! Georgia has about 70 species of crayfish, fourth-most in the nation! For more information about Georgia’s “freshwater lobsters,” check out the Crayfishes of Georgia webpage. The Nongame Conservation Section of Georgia DNR receives no state funds to conserve nongame wildlife, native plants and natural habitats. Instead, we depend on contributions, grants and fundraisers, including the eagle and hummingbird license plates.